FULTON, NY – Dance is back at Arty Camp with Jennica Vehrs at CNY Arts Center August 11-15 along with Theatre classes with Dan Williams. Shaylee Cealie, Rimma Mankiewicz and Autumn Waring perform dance moves taught by dance instructor Vehrs at Arty Camp 2013. Students receive morning art, dance or theatre classes with professionals followed by lunch, which is provided, then group activities and art projects. Art project supplies are provided by a mini-grant from the Oswego City-County Youth Bureau and the New York State Office of Children and Family Services. Scholarships are available made possible with funds from the Decentralization Program, a re-grant program of the New York State Council on the Arts with the support of Governor Andrew Cuomo and the New York State Legislature and administered by CNY Arts. 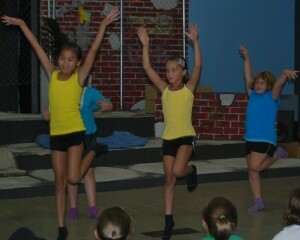 To register for camp, visit www.CNYArtsCenter.com or call 592-3373. For more information, visit www.CNYArtsCenter.com or call 592-3373.